This solitaire uses two decks (104 cards). You have 9 tableau piles with the number of face-down cards per pile increasing from zero to nine from left to right. Then 4 cards are dealt face up to the first tableau pile. 8 additional cards are dealt face up to the each of the eight piles on the right. You may build tableau piles down in suit. 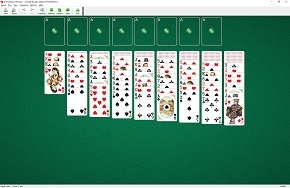 Groups of cards can be moved regardless of any sequence.